Allow me to write my heart today as I feel very happy. 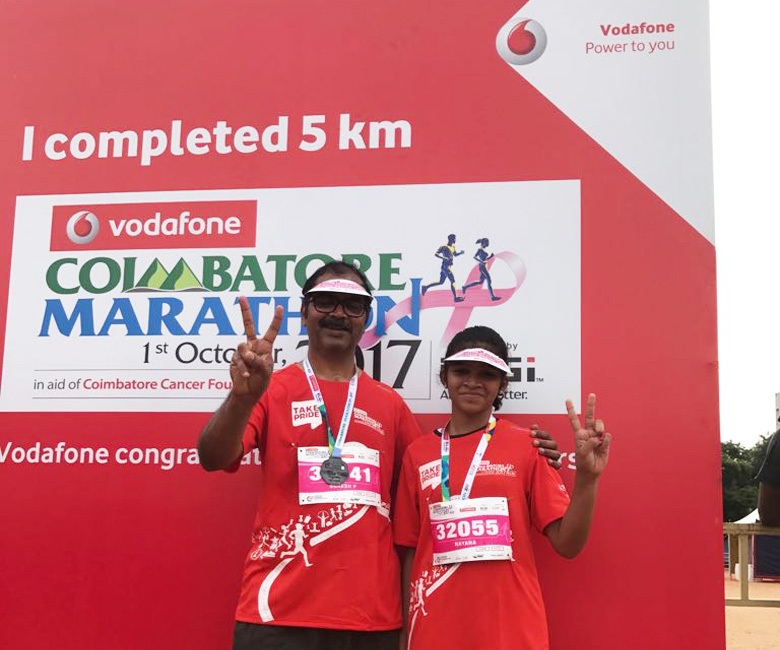 Today I ran a marathon for the cause of cancer in Coimbatore, a cause I have been running for, since 2015. The difference, in this time’s run was that my 12-year old daughter ran with me. Was I catching up with her or she was catching up with me, I am not sure but both of us ran the entire 5 km. All along I was wary of her stamina and likely fatigue. I was playing the role of a responsible father who was concerned of her daughter running 5 km for the first time. I was also equally confident that she will make it with ease as she has the determination and will power which I have been feeling proud about since her toddler days. In the last 500 m stretch she wanted to walk a bit. I told her that she need not stretch herself and she can complete it by walking and that I will meet her at the finishing line and continued on. To my surprise, within few seconds I realised that she caught up with me and was running alongside, with me, to the finishing line. All those beautiful feelings of a proud father, loving daughter, blessed child – gave me goose bumps. We both sprinted together to the finishing line. I thanked God for blessing me with such wonderful child. In the big ground, close to 13500 runners & supporters gathered, most of them had crossed the finish line of the half-marathon, 10 km and 5 km. In that crowd I met the “God of my father” – the cardiac surgeon who did the bypass surgery of my father in 2014. He was with his wife and kid having finished 10 km. I greeted him with all the respect I could muster. I recalled how my father, who is 75 yrs old, came with me to Sabarimala this July, and climbed the entire uphill journey stopping only once to have light refreshment. Same way he walked down, which is a more difficult journey without a break. All along I was playing the role of a responsible son, very closely tagging along with him, ready to support anytime. This emotion gave me extraordinary strength to climb as well to take any additional load like the Irumudi Kettu, side bag etc of my father. He did not give it to me and carried it all by himself. I was wondering was it my love that was giving him the strength or was it his love which was giving me the strength. A proud father and a loving and responsible son.., role reversal today.. a proud father and a loving and responsible daughter.